This weekend we made a journey into the city to see the Burnham Plan exhibit at Millennium Park on the lakefront. It was a trip we contemplated for a while but were discouraged by the time commitment. As we traveled into town, we reminded ourselves why we don’t do this trip very often. Saturday afternoon at 3:30 PM we started out by car and 100 minutes later had crawled our way as far as Wrigleyville. We stopped there to park our car at reasonable rates. A 10 minute walk to the el, then a 20 minute ride before another 10 minute walk. Over 2 hours of commute time one way. Now some of you may suggest we opt for public transportation. The train is 20 minute drive from home, runs once an hour and takes 90 minutes then a 20 minute walk to the park. No time or money saved there. The closest el stop is almost an hour drive from home. And buses? Never see them out here. So now we are at beautiful Millennium Park on a warm late summer evening with my Dad. 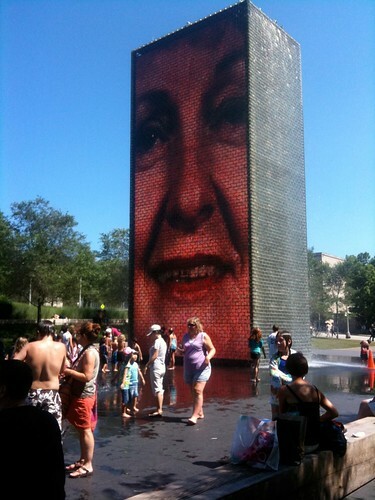 We took video at the Crown Fountain where children and adults are delighted by the smiling faces and surprise awaiting them. Our journey was inspired by the Burnham Plan exhibit with lighting by artist Tracey Dear. After our walk we happened upon Hot Woks, Cool Sushi and had dinner under wall art commissioned by the restaurant. The artwork changes colors like the pavilion across the street. We talked to David, one of the owner of this new restaurant to get the scoop. If you like sushi and art – this is the place to be. The service was slow during our visit. The waitress did not get to our table for over 10 minutes when we arrived. Our appetizers arrived before our drinks. Just open since June, they may still be ironing out a few kinks. Our diners enjoyed the sushi served and gave it hit marks for freshness and presentation. I recommend the sweet potato and asparagus maki rolls. The tempura was served hot with a batter fried light and crisp. Vegetarian items on the menu were clearly marked. For the art lover, take a stroll along the long narrow room where each area displays a different artists work. You can read up on the artists in their bios within the menu. All in all, it was a pleasant way to spend the afternoon. Just wish the commute time was shorter. If the 2016 Olympics land here, perhaps the infrastructure will improve and travel times will drop.